So Congress fears death threats? Chicago has been using these tactics for many years, heck Obama can probably explain to his Communist supporters in Congress about what is now happening. It is called backlash, from placing into law, a health care package that doesn't address healthcare, and only limits freedom and liberty. Oh and a little nothing... that the majority of Americans didn't want it. It is a shame it had to come to this, but I sure am glad I am not you. Enjoy the celebrations, you passed healthcare. Have a stiff drink, enjoy the ride. Pay no attention to that Coffin on your lawn, maybe we can just Trick or Treat a few months early. Lighten up crybabies! November 2010 - A Date that will live in Infamy! Take a look at this and just remember elections in November 2010. 1. U..S. House & Senate have voted themselves $4,700 and $5,300 raises. 2. They voted to NOT give you a S.S. Cost of living raise in 2010 and 2011. 4. You will not get the 3% COLA: $660/yr. 5. Your total 2-yr loss and cost is -$1,600 or -$3,200 for husband and wife. 7. Do you feel SCREWED? 8. Will they have your cost of drugs - doctor fees - local taxes - food, etc., decrease? Congress received a raise and has better health and retirement benefits than you or I. You never did anything about it in the past. You obviously are too stupid or don't care. 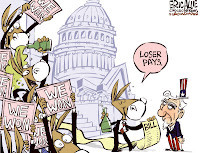 In 2010 you will have a chance to get rid of the sitting Congress: up to 1/3 of the Senate and 100% of the House! Make sure you're still mad in November 2010 and remind their replacements not to screw-up. It is ok to forward this to your sphere of influence if you are finally tired of the abuse. Maybe it's time for Amendment 28 to the Constitution..
"Congress shall make no law that applies to the citizens of the United States that does not apply equally to the Senators or Representatives, and Congress shall make no law that applies to the Senators or Representatives that does not apply equally to the citizens of the United States ." 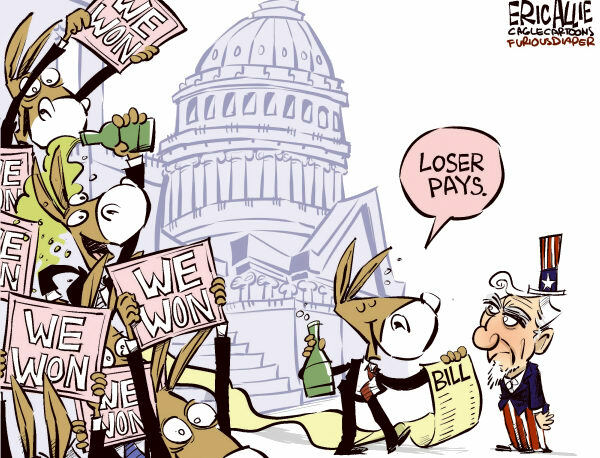 Loser Pays - Says it all. Impeach Obama, wow I didn't even know all of these reasons! Ever wonder what LOL means, or BRB or BFF? Laughing Out Load, Be Right Back, and Best Friends Forever. Get with the program... You can just look them up at the Internet Slang Site, so you always look hip and cultured. Dose of Truth to Obama, by an Unemployed Healthcare Employee. This lady at a rally in Ohio knows more about fiscal matters than the President. How can increasing government control, and mandatory health care, hope to decrease costs? Answer, it can't and won't. Now at a time when the economy, not just the American economy, but World economy, are in disarray.. Why would a US President push 1/6 of our economy into a health care mess? Either he is inept, or he is dangerously ruthless. If you want to know what was behind the movie Avatar, like greed and mind control, this review is the best. Red Letter Media does a great job of reviewing the movie, while highlighting the truth, all while using comedic puns. Very funny! I didn't hate this movie. I just didn't really like it a lot. I think James Cameron is a great filmmaker and I've liked a lot of his movies, but this one was just a little too simplistic plot wise. It worked with Titanic for some reason, but this one not so much? Grow old, but never get old!